Manga Entertainment are the UK's longest established anime label, with their iconic cross logo having adorned UK releases stretching all the way back to the VHS era. It's been all change in the past few months though, with their highest profile staff leaving to set up Animatsu or join Anime Limited. It's now also been confirmed that they've been sold by parent company Starz Media. It's no reason to be concerned though- they've gone through numerous owners in their 20+ years. They've been acquired by the company's managing director Colin Lomax, a safe pair of hands who has been involved in home entertainment since the 1980s. Confirming it's business as usual, Manga subsequently announced some forthcoming releases. They've finally confirmed that the next four box-sets of popular pirate saga One Piece will be released in the UK in 2015. The next release will be collection 9, which will be available from April 13th. 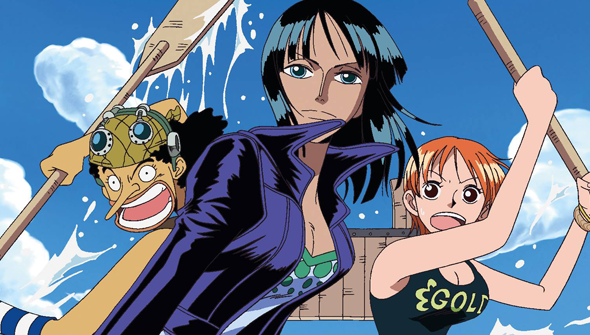 The also announced that the twelfth theatrical feature in the franchise will be coming in the form of One Piece Film Z. One of only three One Piece movies to have received a dub from US distributors FUNimation so far, Film Z is getting a Blu-ray and DVD Release on May 25th. Meanwhile fellow label Anime Limited has also been furnishing UK anime fans with more updates of their own. Following a previous delay, Gainax's acclaimed Wings Of Honneamise will now be released on Blu-ray, DVD and Collectors Blu-Ray on April 27th. Thanks to being hit by a series of unavoidable delays recently, they have now announced they'll be bringing forward another release: the standard Blu-Ray/DVD release of HAL will now be on March 23rd. Read their full schedule here.